This is the first time in some years I have cooked carrot cake from scratch but is proved as simple as ever. 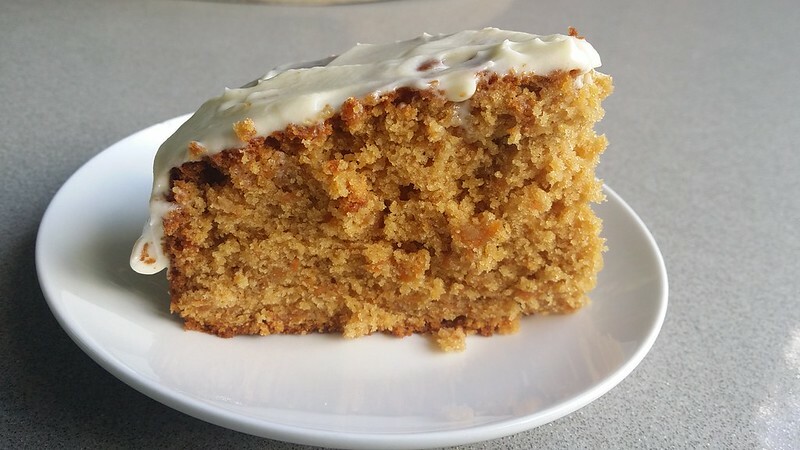 I tried to reduce sugar so went looking for a recipe that was a bit lighter on sugar, then adapted it..
To prepare cake, weigh or lightly spoon flour into dry measuring cups, and level with a knife. Combine flour, ground cinnamon, and salt in a medium bowl, stirring with a whisk. Add grated carrot, tossing through with a fork until evenly combined. Place granulated sugar, brown sugar, and butter in a large bowl. Beat with a mixer at medium speed until combined. Add flour mixture and milk alternately to sugar mixture, beginning and ending with flour mixture. Take a 200 mm circular spring baking pan, grease very lightly, can put two layers of baking paper on the botton, and a layer of baking paper around the inside ring. Pour or spoon mix into the pan coated with cooking spray. Bake at 180°C for half an hour to an hour, or until a wooden pick inserted in center comes out clean. It is good to test as the time can vary significantly depending on the oven. Place soft cream cheese, butter, vanilla extract and salt in a medium bowl. Beat with a mixer at medium speed until fluffy. Gradually add castor sugar, beating at medium speed until combined (don't overbeat). Spread icing thickly over top of cake.